Wednesday, August 29, 2018 – Time to Start Getting Ready! Be Cool! Wednesday, August 29, 2018 – Let’s Get This Party Started! Be Cool! What are you wearing to the Aggie game tomorrow? I will be wearing a maroon T-shirt and shorts and tennis shoes. I will be sitting in my air conditioned living room on my high tech recliner. To accessorize I will be holding a maroon and white Texas Aggie Coozie fitted with an amber glass bottle of liquid. I hope I have enough amber bottles to get through the Fourth Quarter. The Aggies will take the field tomorrow evening at 7:30 against Northwestern State University. Temperature in Kyle Field should have fallen into the lower 90’s by kickoff. It is going to be hot. Hot and muggy. Welcome to August in Texas. However, The Aggies will be cool thanks to Adidas and their technology. “Jerseys are body-mapped for a refined fit.” I am not sure what that means, but it sounds like the jersey fits perfectly on the player. Jerseys have these ribbed knit patterns that are engineered mesh panels. These mesh panels channel a feature something Adidas made up called Climacool. It provides breathability and cooling zones to the players. The inside of the jersey features silicon grip patterns on the shoulders to lock the jersey in place over the shoulder pads. Climacool? Cooling zones? I wonder if that cooling feature comes in something my size? As long as it comes in his size, keeps him cool and running away from defenders toward the goal line, I do not care about the high tech ribbed patterns. Trayveon Williams waving to ME! It is the eve of the First Yell. 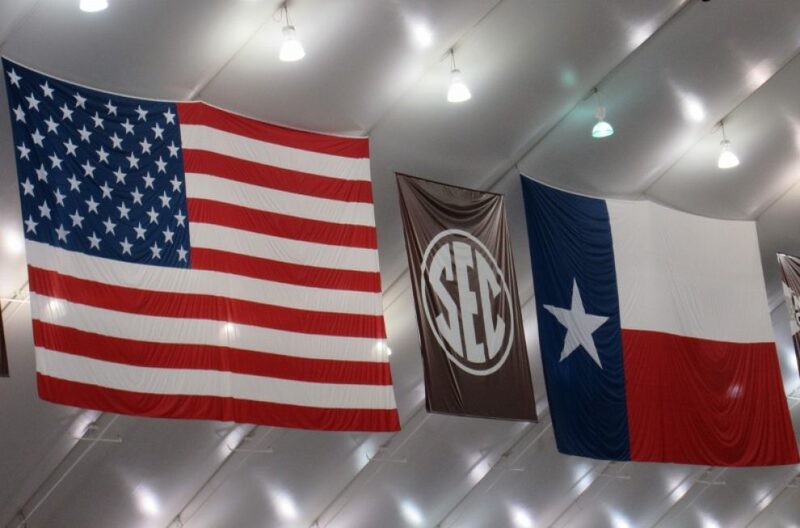 That is meaningful to Texas A&M Aggies. Here is a partial translation for the uninformed others. 10 P.M. Wednesday, August 29, 2018. If the game is early (Thursday) then Midnight Yell is early at 10 P.M.
You read that correctly. The Midnight Yell will be at 10 P.M. I don’t care how much earlier it is, I’m not going. Ms. Navasota and I are still looking for our cowboy boots left somewhere in the mud in 1983 on the way to then called Midnight Yell Practice. For the Northwestern fans and other uninformed, Midnight Yell is when as many as 30,000 people stand in Kyle Field usually at midnight (and usually drunk) and practice the yells for the coming game. Here are two of the Texas Aggies we will be yelling for. Signing my Fan Card at Fan Appreciation Day. Photo by me. Starting quarterback Kellen Mond.a 6’2’/210 pounds from San Antonio, but high school is IMG Academy in Florida. Trayveon Williams-a 5’9″/200 pounds; Running Back; from Houston, C.E. King High School. Me: a 5’8″/not 200 pounds; Running Backwards; from Magnolia, Magnolia High School. Trayveon Williams signing my Fan Card. Photo by the 15 year old I handed my phone to. To whom I handed my phone???? Follow the bouncing football and sing along to my version of It’s the Most Wonderful Time of the Year. Click on the arrow for the instrumental. From bowl games from long, long ago. With Championship Rings just for show. Wednesday, August 22, 2018 To: The Person or Persons that wrote on the statue. To: The Person or Persons that wrote on the statue. How dare you vandals desecrate ANY statue, building or structure by writing or painting graffiti? How dare you write racist graffiti on the statue of Sul Ross on the Texas A&M campus? Lay those pennies and Lawrence Sullivan”s feet for strength and good luck. The person(s) are obviously under-educated and overly brainless. Had you gone to orientation, you would know the history of Sul Ross and Texas A&M University. The Sully statue is the oldest on campus and has been a fixture in front of Texas A&M’s Academic Building since its 1918. It stands for Sul Ross’ contribution to higher education, not for his Confederate military service. Disrespect and stupidity runs rampant among the classless. I thought this might cool us off a bit. My neighborhood last winter. Come along and be my party school; Come along and be my party school; come along and be my party school and I’ll flunk out with you. Twelve thousand (12,000) Aggies move in this weekend. That is the estimated amount moving in to live on campus. This does not include off campus residents. Classes begin on August 27. I do not know why the first day of classes is not August 30. Might as well add to the total transportation and confusion on campus with Reveille VIII’s internment, freshman ticket pull, the SEC trucks setting up, tailgating and the season opener for the football team. See where your alma mater or your school of support lays on this grid of Academics and Partying. I am confident the research done by Barstool Sports is accurate, reliable, and valid. I can speak from experience that research conducted in bars becomes louder and less reliable as the tequila shots become more abundant. Here are my interpretations. I see most of the SEC conference in the Most Party/Least Academic quadrant, including Alabama, Auburn, LSU, Mississippi State and Ole Miss. Of course the Texas Aggies are Most Party/High Academic. Remember that an often forgotten attribute of why the SEC wanted the Aggies was – to raise the GPA of the SEC. Georgia in the same quadrant as the Aggies? Really? You host the Largest Cocktail Party when you play Florida! From the Big 12 I see Texas Tech as Most Party/Least Academic. Of course if I had to live in Lubbock I would have to party 24/7. I see Baylor as Most Academic/Least Party. The surveyors obviously did not interview members of my family regarding the party aspect. Oklahoma State appears to be Most Party and Low academics. Again, if I had to live in Stillwater, I would do the same as if I lived in Lubbock. THE University of Texas at Austin in the High Party/High Academic. TU, just because you are in the same quadrant as Stanford, you cannot compete with them academically. Smart people versus super smart people. I see BYU as the Least Party/Most Academic. Those Mormons don’t even drink Dr. Peppers! The Most Party/Least Academic “honor” goes to The University of West Virginia – Moonshine University where they burn sofas and couches when the football team wins. I hope you can find you school of support. It appears many lie bunched around or on the axis. It is indeed time for colleges and universities to move in and start to party. As the adage says “College is a fountain of knowledge where kids go to drink.” But don’t drink and drive.